The rich sage green color of these green aventurine gemstones is shown off to perfection by gold tone wire wrapping in these handmade gemstone earrings that are elegant and fun at the same time. Aventurine is known as a stone of chance or luck and is a stone of opportunity. It's said to enhance one's perceptions and insight and is an excellent stone for wearing on a daily basis or slipping on for special occasions. 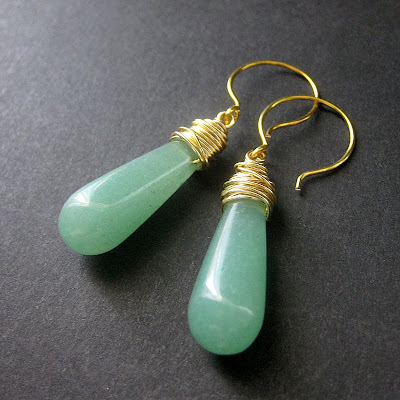 These handmade wire wrapped earrings of aventurine are both light weight and easy to wear.